When Azure® Active Directory® was released, many IT admins thought they would finally be able to move Active Directory to the cloud. Unfortunately, this hasn’t been the case. IT admins are not able to manage systems, leverage Group Policy Objects (GPO’s), or implement organizational units with Azure AD, like they have been able to with Active Directory and on-prem. These features were crucial for Leonard Lee, who knew he needed the full power of Active Directory in the cloud (in other words a cloud alternative to AD). Leonard Lee is the Head of System Solutions & Infrastructure at GMEDES Pte Ltd, a healthcare technology-based solutions provider. GMEDES developed an e-pharmacy medical prescriptions platform, called G-MEDS, that allows doctors to care for their patient’s prescription needs even when their patient is thousands of miles away. Leonard’s roles and responsibilities include driving vendor analysis efforts to quantify functional/cost differences of third party products or services. With an unmanaged mobile workforce, Leonard was in the market for a solution that could provide Mac device management, offer GPO-like capabilities, and integrate with Office 365™. JumpCloud® Directory-as-a-Service® was the powerful cloud identity management solution Leonard needed for his modern workforce. Below, Leonard shares how JumpCloud is helping him gain control over his IT environment. What was it like managing your mobile workforce with AD? Leonard: We had a larger problem than that. We had Microsoft® Exchange and Active Directory (AD) hosted remotely. There was no domain controller on-premises to hook up with AD. This meant there was no identity management available. Each workstation was not hooked up to AD like they should have been in good practice. This caused a fair bit of grief when it came down to identity management within the organization, including the enforcement of policies. There really was no issue with managing the mobile workforce specifically. The real issue was we just couldn’t manage the workforce at all! How is JumpCloud making that easier for you? Are there any time or cost savings? Leonard: JumpCloud is a godsend. Azure Active Directory – even though it brings up memories of the full-fledged identity solution, AD – it isn’t the same. It just isn’t the solution for the modern workforce where the power of a core identity provider, like AD, is required. Identity management with JumpCloud, on the other hand, is dead-easy. The Users and Systems menus within the JumpCloud console saves a fair amount of time when it comes to setting up an environment and making edits. For example, my test environment included two local systems, a Mac and a Windows system, and two remote locations with one system each. All systems were set up in a matter of minutes. Additionally, any change made to a system is accepted within the minute. Voila! So far they’ve been pretty compliant and JumpCloud works like a treat. Cost-wise, the Azure Active Directory Premium setup would’ve cost us in the ballpark of $20K annually, with all required bits needed to give us the necessary identity and access management capabilities. JumpCloud trumps all of that with 10 users free forever and a “per user” pricing that doesn’t hurt the pocket. How is JumpCloud helping you with system management? Leonard: Microsoft Active Directory really only handles Windows systems, and my corporate environment has Mac systems. Having to maintain Macs with AD would’ve been another fight altogether with the need for more components. We’re only just touching the surface with JumpCloud, but I’m already seeing improvements in managing systems at the workplace, especially in areas like configuration management and workload automation. Commands and Policies alone have allowed me to roll apps out and conduct maintenance duties in the background. Additionally, I also tested the RADIUS capability. It’s allowed me to bring all systems in the wireless network to enterprise level authentication, and allowed me to improve network connection security at the workplace. How rad is JumpCloud? 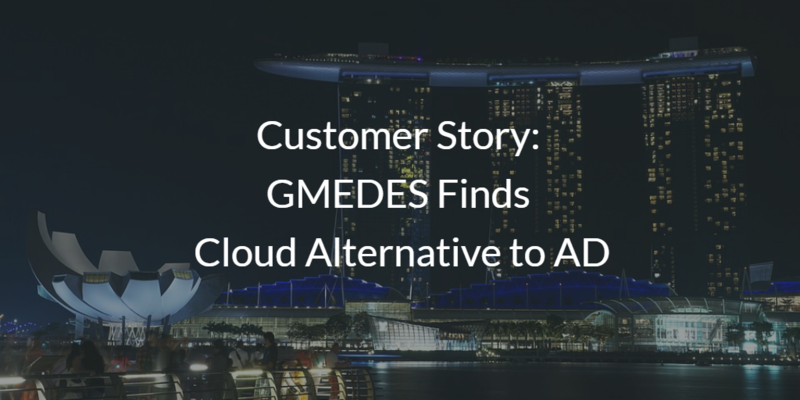 If you enjoyed learning about GMEDES’ experience with JumpCloud, consider reading Grab’s case study to find out how they centralized 3000+ user access to all of the resources in their environment. For more information on our cloud alternative to AD, drop us a note. You are also more than welcome to start testing our cloud identity provider and all of its features by signing up for a free account. Your first ten users are free forever.